Can anyone tell me what is better than sweets? I could spend every Sunday making peanut-butter pie, Texas sheet cake and cheesecake bars, using my beautiful Kitchen Aid mixer until the motor blows. I could wear my custom-made apron and say things like “It’s a good thing,” with a Martha Stewart-like tone. I know PoppaNut wouldn’t mind one bit sampling all the delicious things I would bake up! But now baking just got so much better. The secret ingredient: LIQUOR! That’s right … Cheesecake bars, please meet Bailey’s Irish Creme. You guys are going to get along just fine. And in honor of such a partnership, I have added a list of liquor-loving desserts that you just have to try. In fact, I’m thinking about whipping up one this week. Which one should I make? Heat oven to 350°F (325°F for dark or nonstick pan). Grease bottom only of 13×9-inch pan with shortening and lightly flour, or spray with baking spray with flour. In large bowl, beat cake mix, water, oil, eggs, gelatin, 1 tablespoon lime peel and the rum extract with electric mixer on low speed 30 seconds. Beat on medium speed 2 minutes, scraping bowl occasionally. Pour into pan. Bake 35 to 40 minutes or until toothpick inserted in center comes out clean. Cool completely, about 1 hour. Stir 2 teaspoons lime peel into frosting. Spread frosting evenly over cake. Store loosely covered at room temperature. Just before serving, cut each whole strawberry in half, leaving leaves on. 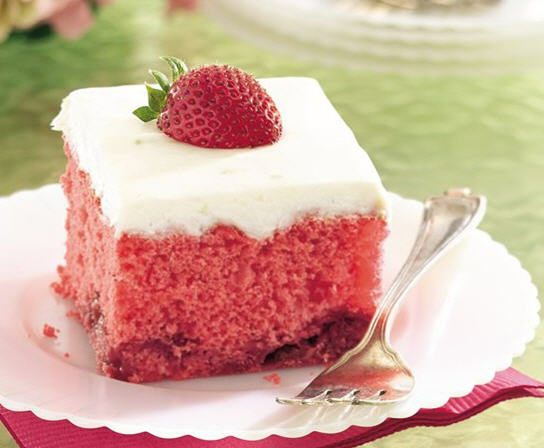 Garnish cake with strawberry halves. Heat oven to 375°F (350°F for dark or nonstick pan). Place paper baking cup in each of 24 regular-size muffin cups. In large bowl, beat cake mix, oil, water, 1 teaspoon rum extract, the pineapple and eggs with electric mixer on low speed 30 seconds. Beat on medium speed 2 minutes, scraping bowl occasionally. Divide batter evenly among muffin cups. Bake 14 to 19 minutes or until toothpick inserted in center comes out clean. Cool 10 minutes; remove from pan to cooling rack. Cool completely, about 30 minutes. Stir coconut extract and 1 teaspoon rum extract into frosting. Spread frosting on cupcakes. 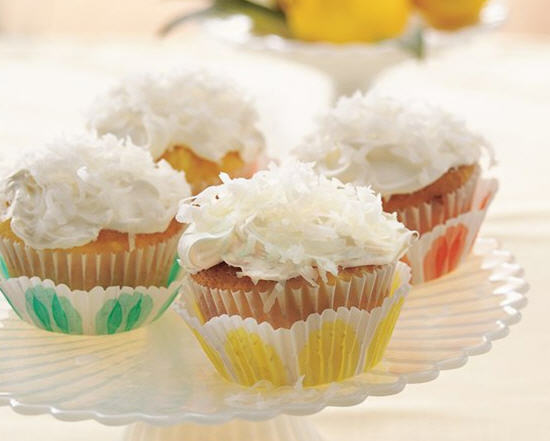 Dip tops of frosted cupcakes in coconut. Store loosely covered at room temperature. You can find more at BettyCrocker.com. And that’s life in a nutshell, giving happy hour a whole new meaning is just priceless! Love it! They sound yummy.